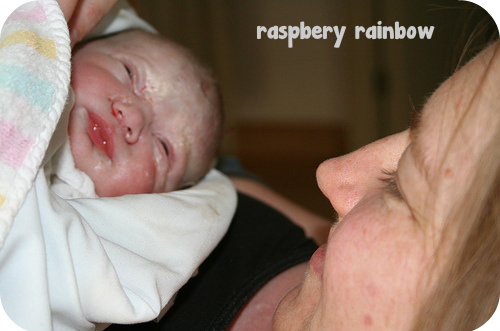 Raspberry Rainbow: 6 years ago today, it was a Tuesday. Six years ago today, it was a Tuesday. I was 8 months pregnant with my first baby. I was baking a double batch of Anzac biscuits. It was Anzac day in Australia after-all, and it was a public holiday (bank holiday), I had the day off work. I took some of the Anzac biscuits over to my Grandma, we had a cup of tea and a chat. I then went shopping, and bought the first set cot sheets for the baby. The Shropshire boy was out for the day, he had gone to the MCG to watch a game of AFL, the Collingwood versus Essendon derby that is held every Anzac day. He did not take his mobile phone with him. I was happy. Work was kindly holding a morning tea in my honour the next day, which was to be my last day of work before starting Maternity leave. I was looking forward to being on leave, maybe catch up on some sleep before our baby was born, pack my hospital bag and to get the room ready for the baby. I needed to research which cloth nappies I was going to use and I definitely needed to buy some baby clothes. For the first time, I was suffering from fluid retention. I put it down to probably overdoing it during the day. I went to bed with swollen ankles, hoping they would go down overnight. I went to wake up the sleeping Shropshire boy, it was like a scene in a movie. "Honey, my waters have broken, we are having our baby". He just mumbled something and rolled over until I shook him more fiercely and told him again, in a louder voice that we were having our baby. Neither of us panicked. The Shropshire boy suggested I phone the hospital, which I did, and they told us to take our time coming in. We actually lived in the same suburb as the hospital back then, and we could have walked there. We packed the hospital bag, this took a while in our sleepy and shocked states. By the time the Shropshire boy was driving me to the hospital, contractions had started. We really were having a baby. Our beautiful Abbey was born just after lunch, a quick 6 hour birth. I was a mummy! The rest of the story I have already shared on my old blog, over here. So six years later, today, it is a Wednesday. I am going to bake some Anzac biscuits. Zoe and I will wrap Abbey's birthday presents and make her a birthday card. I will remember why Australians and New Zealanders commemorate Anzac day. Tomorrow, I will have been a mummy for 6 years! HappyBirthday beautiful Abbey, Well done mum and dad. Our future generations bon on Anzac Day is a privelige, for sure. What a beautiful birth story. I do love reading about everyone's different experiences. It's lovely how you now associate the Anzac biscuits with the birth of both of your girls, amazing you were baking them before they decided to enter the world. It must have been so scary for you, in week 35, I can't even imagine, as both of my boys ran to full term. Such a lovely story Cat - I was just thinking about you yesterday (no idea why!) and wondering how you were doing in HK. All well, I hope!